Bookerville offers a complete and proven Vacation Rental Management Software solution that is perfect for multi-property vacation rental managers, do-it-yourself vacation rental owners, and even private vacation homeowners! So enjoy being a vacation rental manager again with Bookerville's fully-online vacation rental software! - can be integrated into your PayPal, Authorize.net, and any online payment gateway that provides real-time notifications of completed transactions. Choose to require pre-payments to secure bookings. - Send bills to guests for scheduled payments and they pay into your account! - embed your Bookerville public availability & booking calendar (or other widgets) directly into a page on your own website. Custom Colors will blend seamlessly with your page! Amazing (and Free) Customer Support! We're here to help you setup, learn, integrate into your web site, enter data - whatever you need. Click here to see our rave reviews on Capterra. - set up a custom contract, and optionally force guests to agree to it before proceeding, and Bookerville captures electronic agreements to your contract or terms & conditions. Your contract can also be included in your emails, with pre-populated customer details, amounts, and much more. greatly simplify your correspondence with guests, prospects. Customize the wording, make your own, and use your own header graphics! Create quotes manually, or automatically from VRBO/Homeaway/Flipkey inquiries. Send to guests and they can confirm, pay any pre-payments, etc. So smooth, so easy! online booking, available 24/7, 365 days a year! Need longer? Just ask! We want you to be sure Bookerville is perfect for you. as low as $13.95 per property - less than a pack of light bulbs! $49.99/year * Basic: Great for property managers, rental property owners, and vacation home owners who don't need to set rates or collect rent. 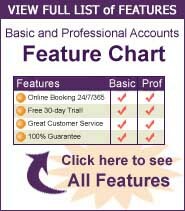 The Basic Account supports all features except the ability to calculate charges and collect pre-payments. At only $49.99 per year for a single property, and steep discounts for multiple properties, it's a terrific value! Professional: Great for property managers, rental property owners, and vacation home owners who need flexibility and convenience when setting rates and providing custom-priced options for their guests, and who may want to collect pre-payments for bookings. At only $74.99 per year for a single property, and steep discounts for multiple properties, it offers industry-best features at an unbeatable price. * Price for single-unit calendar. Multi-property communities, inns, B&Bs - see Pricing Schedule for volume discounts. Bookerville takes pride in providing cleverly-designed, highly thought-out, customizable features that match how you need to work! Don't see something you need? Please let us know. Allows you to automatically send out emails on a set schedule. Ideal for payment reminders/past due notices, cleaning crew notifications, key swap office alerts, final check-in instructions, and more. Can be setup to send days before or after payment due dates, check-in date, check-out date, or the date the booking was made. Collect payments automatically - no phone calls! This flexible super-feature lets you automate as much or as little as you want. Super Feature: Rate-Setting Tool - We took a look at how several of our competitors make you set rates, and we decided we've got to do better than that! We wanted it to be easy to understand, and fast. We love it: You can set nightly, weekly and monthly rates with just a few clicks. You can Set Rates By Date Range, which allows you to 1) Set rates for ranges of dates for any number of seasons, 2) Set a different rate for the weekends for those same date ranges, and 3) it's great for properties with seasonal ranges like high, mid, and low season. You can Set Rates By Clicking, which means you can 1) quickly and easily set certain special days to different rates. Click the days and enter your holiday rates with just one click. You can also Copy Your Rates Forward to future years; this is a totally awesome time saver. Bookerville is even smart enough to adjust the dates with the days, so your weekend rates still fall on your weekends. Watch our video on Setting Rates in Bookerville. And Bookerville is smart enough to figure that out - it will only allow you to add combinations of properties that are available. Since this feature is still in an early phase, we are collecting ideas and feedback in our Bookerville Forum. Super Feature: Guest Ranking - Rank guests on a per-booking basis, and share in the Bookerville community statistics so you can be informed on who is inquiring about your rentals. Bookerville keeps track of rankings across the whole system, and also whether security deposits were retained for damage, and if so how much. This is information is crucial to build and use for a successful VR business, and Bookerville lets you see in aggregate what other managers have experienced with guests. How often do you view someone's so called availability calendar and see available days to then have to email the owner and hear "Oh, that week is actually taken!" How frustrating! With Bookerville's Vacation Rental Management Software, guests can see availability and rates in real-time. Guests can come to your website, facebook page or blog, and view availability of your rental in realtime. That means when approved bookings are made on your calendar, they appear automatically on your availability calendar. Potential guests can confidently know when your beautiful rental is available for them to rent! Click here to view Bookerville's Booking Demo on our practice calendar. You want online booking? Like real, honest live online booking? We've got it. With Bookerville's Vacation Rental Management Software, you can choose to run your calendar in Guest-Centric booking mode, which allows for true online booking. It's different, and really neat! When you choose Guest-Centric booking mode, guest reservation requests appear right away on your calendar, preventing other guests from booking the same or overlapping dates. Guests love this! Guests can pick their days, price out their stay, and secure their booking by paying online. As the manager, you don't have to do anything! Don't worry - some of our managers want to email or talk with their potential guests first. You can do this with our Manager-Centric mode. 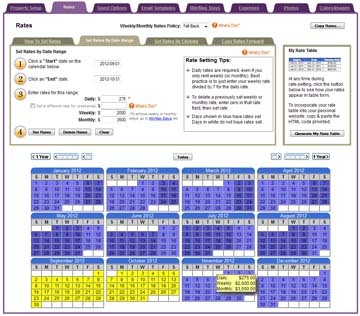 In this mode, guests can still use your calendar to see availability, price out stays, and make requests, but the bookings only appear on the calendar after manager approval.